‘At once I was in the Spirit, and there before me was a throne in heaven with someone sitting on it’. So starts the second part of the book of Revelation. How are we supposed to comprehend multidimensional space and time when we have only experienced the four dimensions of length, breadth, depth, and time? In truth we can’t, we have no frames of reference or words to describe what is beyond both our experience and our intellectual capability. This is why Revelation is presented to us in picture-language that draws on known imagery and established modes of thought. John is shown that at the centre of the creation is a reality presented to him as a throne… with someone sitting on it! John then continues with the words, ‘At once I was in the Spirit, and there before me was a throne in heaven with someone sitting on it.’ (Revelation 4:2) The universe, in all its dimensions, is not a sea of chaos or a mindless cosmic machine. It is an ordered creation, centred on the one who created it. This is a key truth that forms a pivotal reference for all of Revelation. No matter how many strange, bizarre, and even frightening pictures emerge as we read through the book, we must always remember who is at the centre of it all, calm, unassailable and supreme… Almighty God. 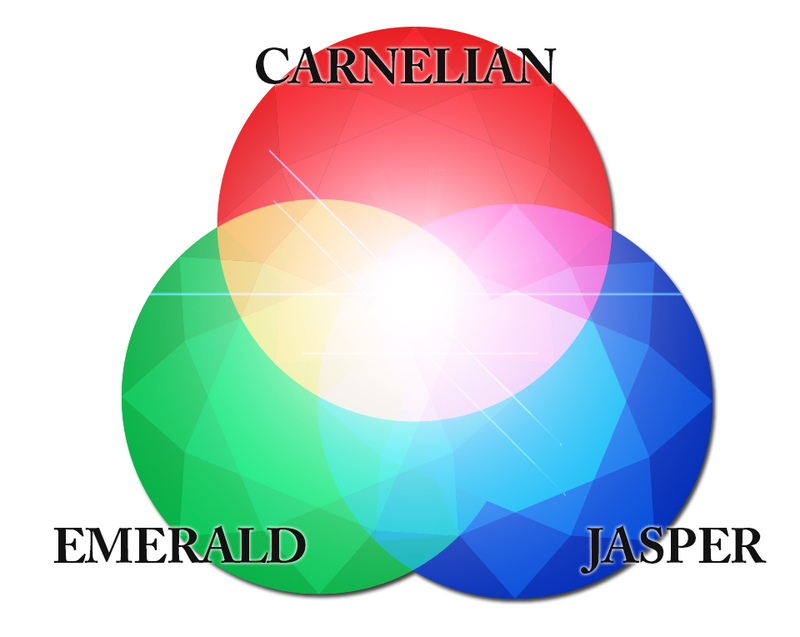 Now, look at how John describes what he is given to see of God himself: ‘And the one who sat there had the appearance of jasper and carnelian. A rainbow, resembling an emerald, encircled the throne’. (Revelation 4:3) There is much debate in the commentaries about what these ancient gemstones were and what they represent. Jasper is usually opaque but a rare ancient form of it (iapis) was a transparent purple-blue much like the modern Sapphire. Carnelians range from opaque orange to transparent red (ancient Sardine). Emeralds of course are green. Pure white light refracts into red, blue, and green, colours known as Additive Primaries and white light shining through these gemstones would produce these three brilliant colours. 1 John 1:5 records that ‘God is light; in him there is no darkness at all’. So, what we have here in Revelation 4 is a graphic depiction of an aspect of the glorious luminary who occupies the centre of all things. Things get even more fascinating when we consider the nature of light. Scientists have long been baffled by what they refer to as the wave-particle duality of light – Light is simultaneously a stream of particles and a wave. This is incomprehensible to us but it does shed some ‘light’ on an aspect of the nature of God. Incidentally light is usually categorised as visible, infrared, and ultra violet – just as we have traditionally categorised God as Father, Son and Holy Spirit. The response to the citizens of heaven to the presence of God in their midst is recorded in Revelation 4:8, “Holy, holy, holy is the Lord God Almighty, who was, and is, and is to come.” (Three sets of three: ‘Holy, holy, holy… Lord, God, Almighty…. Who was, who is, who is to come’). And when we contemplate this extraordinary depiction of God in further on in Revelation we too must surely echo the worship expressed in these wonderful tri-form words! It is hard to conceive that there are even further levels of revelation in this complex chapter… but there are, and in my next post I will write about the second of three dimensions of meaning.